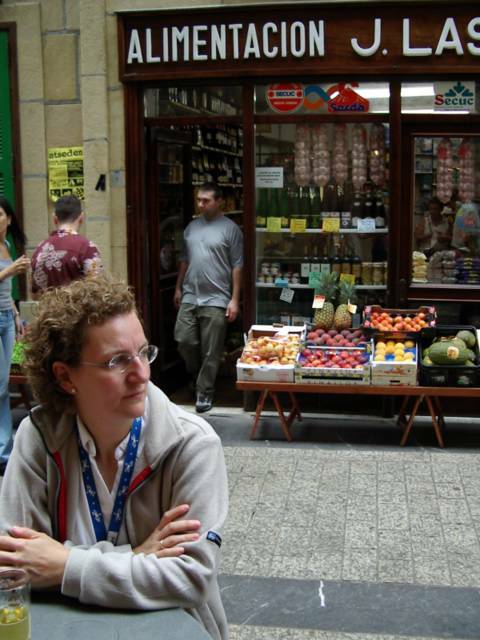 SAL DeTRAGLIA'S VIRTUAL TAPAS BAR: A SATURDAY IN SAN SEBASTIÁN. María and I celebrated our seventh wedding anniversary last weekend by leaving Inés with the grandparents and travelling to San Sebastián in the Basque Country. Since we had visited San Sebastián in 2000, we felt free to skip the typical tourist sites and concentrate on more important cultural matters: namely, pintxos. Broadly speaking, “pintxo” is the Basque term for “tapas” – a small snack that is eaten with your drink at a bar. In practice, however, the terms differ. A tapa can be anything from a fried sausage to a slice of potato omelette to a dish of peanuts or olives. The bartender will hand you a tapa free of charge each time you order a drink; except in miserly Cataluña, where nothing is provided for free except Catalan language courses. A pintxo, on the other hand, is usually a small slice of baguette bread, toast or croissant topped with another item. Toppings can be as simple as a slice of smoked salmon, or as elaborate as crabmeat salad capped with a dollop of caviar. Pintxo bars are typical of the Basque Country, and in particular San Sebastián; a city with a world-class reputation for good eatin’. The procedure for ordering pintxos is simple. The bar will be lined with plate after plate of them. When you order your beer, wine or hard cider, the bartender will (upon request) hand you a plate. Simply graze along the bar and select the pintxos that look most appealing. All pintxos are the same price. When you are ready to pay, tell the bartender what you drank and how many pintxos you ate. This works strictly on the honor system. And it does work. Spaniards, who tend to be weasel-like when dealing with salesmen or tax authorities, are scrupulously honest when telling a bartender how many pintxos they’ve had. Pintxo dining is not a sit down affair. Rather, it is a rolling feast from bar to bar. Stop at a bar, order a drink, eat the pintxos that look good, then move on to the next bar. This was exactly how María and I spent our Saturday in San Sebastián. We researched San Sebastián’s best pintxo bars beforehand, and then pounced on them like army of invading barbarians. Listed below – in order of preference – are the pintxo bars that we visited during our trip to San Sebastián. This was our favourite pintxo bar. Pintxos here are elevated to works of art. We ate the following four pintxos (all of which were served on a slice of baguette): Foie gras with mango, caramel and black pepper; mushrooms, shrimp and garlic; roasted red and green pepper with egg; anchovy, shrimp and shredded hard-boiled egg whites. This was our second favourite pintxo bar. When I say that they specialize in anchovies, I refer to the marinated fresh ones…not those mushy, salty things that come from a can. We ate the following four pintxos (all of which were served on a slice of baguette): Anchovies with sea urchin roe; anchovies with marinated minced green pepper, tomato and onion; anchovies with black olive paste; anchovies with a creamy spider crab salad. Address: 31 de agosto, 9. What this bar lacks in creativity, it makes up for with high-quality pig parts. Many of the pintxos took the form of little sandwiches. We ate the following three: Sliced, cured wild boar on a mini roll; sliced Jabugo cured ham on a mini roll; anchovies with roasted red pepper on a slice of baguette. The wild mushroom choices are not displayed on the bar. Rather, they must be ordered. We took a pass on the mushrooms, because the pintxos on display looked good enough. We ate the following three: Smoked salmon on a mini croissant; skewer of marinated fish roe (known as “huevas”) with a slice of raw onion and parsley; oven-baked crab salad in a mini tart pastry. The pintxo jag described above wasn’t the reason we went to San Sebastián. The point of the trip was to have dinner at Arzak later that night. This leaves me with a small dilemma. So much has been written about Arzak by others, that it seems pointless for me repeat the task here. It is world-famous, and deservedly so. It would be more pointless still for me to attempt a “review/critique” of the food and service. The joint has three Michelin stars, which means it is the embodiment of perfection. And it is. So there…that’s my restaurant review. Starters: Blue potato with bonito tuna under a mound of canónigos greens; raviolis of foie and a creamy cheese; lettuce soup; paprika-dusted melon with a slice of anchovy; various other items of which I can’t recall the specifics…except that one involved deep-fried banana slices shaped as a funnel and filled with a white cream. First course: Soft “flower” of poached egg with pureed chistorra sausage with date; small langostinos. Fish course: Monkfish with a garlic broth. Meat course: Foie gras with mint and saffron-poached pear, served with a glass of Sauternes; beef with a salpicón of cereal grains. Cheese course: Assortment of five cow and goat cheeses, arranged in order of potency and served with grilled fruit and walnuts. Coffee: Café cortado, served with artisan chocolates. Wine: Roda I (D.O. Rioja). Digestif: Anís de Chinchón, dry. Dinner at Arzak was great fun, but the most entertaining part was watching the tables full of kids around us. Kids at a Michelin three star restaurant? This was a bit of a shock, although not enough to make us doubt the logic of leaving Inés with her grandparents. Whether these were highly enlightened kids or parents with too much disposable income was irrelevant. María and I were amused. At the table to our left, a seven year old boy slurped his fettuccine and tomato sauce while his parents enjoyed the same tasting menu that we chose. The table to our right had three pre-teens. There was much debate amongst this family about what the kids should order. The debate stopped when the big man himself, Juan Mari Arzak, waddled up the stairs and ordered for them. Whether they liked it or not, these three kids were served steak, French fries and croquettes. And yes…they DID like it. Somewhere throughout this piece you should be thanking your parents for the wonderful genetics they passed on to you - otherwise you would be quite large after all the food you consume and love! I would like to thank my parents for giving me the genetic gifts of high metabolism, low bodyfat and low cholesterol. Without these, my famed gluttony would not be possible...at least over the long term. I would also like to thank my parents for leaving me their ski villa in Aspen, their beach house in Santorini and their seven German sports cars...none of which my siblings know exist. Needless to say, you can have it.